Throughout her art practice Beverley Veasey makes wry and gentle observations on the relations of humans to the world around them - the landscapes we build for ourselves and our engagement with the natural world. Natural History, her latest body of work, is a collection of 10 images depicting animals and birds in artificial environments. Unlike the animals in a zoo amongst fake rocks and ponds, these animals are in stark white enclosures. In removing all traces of a natural habitat Veasey's works amplify our often mediated experience of the natural world in a subtle and potent way. 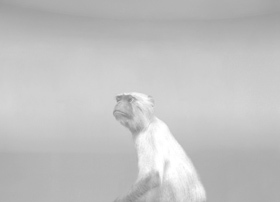 In isolating animals such as monkeys and goats and presenting them almost as if they were subjects of a studio portrait she also creates pathos. Their animal expressions have a melancholy air that we could read as a response to their spare and finite world, an effect enhanced by the subtle tonal quality of the works. Beverley Veasey has been a practicing artist and teacher for over 10 years. She currently lectures in photomedia at the National Art School in Sydney. Her work has been featured in many exhibitions both in Australia and overseas.